As of July 1st, I became the new president of FOTA. For me, this is an exciting opportunity to serve the OT practitioners of our great state. As a FOTA member, you may be wondering what having a new president will mean for the organization. Where are we headed? The good news is we’ve had several years of great leadership through President Elena Vizvary. In my time as President-elect, she provided me with strong support and good information about the major issues facing organization. I thank Elena for all her guidance and mentorship as I take on the daunting task of leading FOTA. I have big shoes to fill. My task is to pick up the torch from Elena and move FOTA forward. Luckily for me, there continues to be a solid core of hard-working board members, committee chairs, and volunteers helping FOTA meet its objectives. Most importantly, there is the FOTA membership that forms the basis for all we can achieve as an organization. 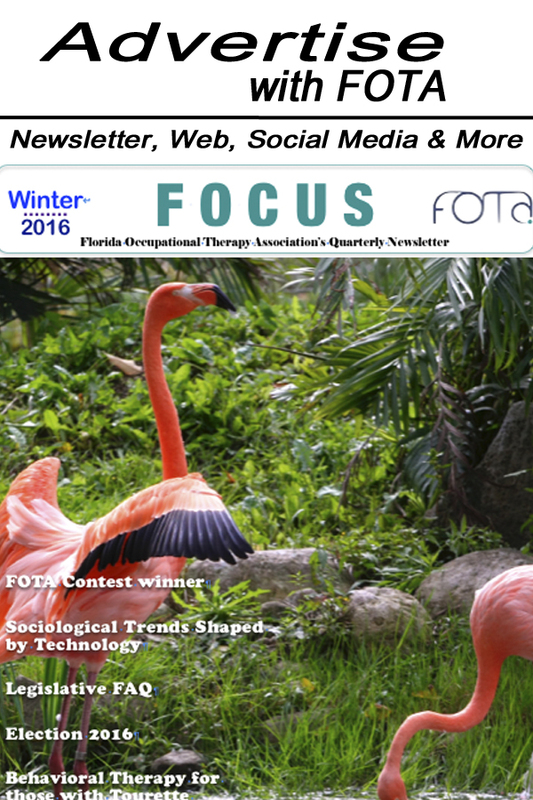 The reality is that more membership and more active participation in FOTA will lead to a stronger and more influential professional association advocating for OTs and their clients in our state. Advocating for OT practice in our state. Building Membership- I put this item first because the truth is that FOTA needs more members who sustain their memberships over time. In terms of organizational finances, volunteer service, and numbers for a power voice of advocacy, increased FOTA membership is a big key to progress as an organization. Responding to Needs- It is a priority tocollect feedback from members, and use that input for improving the membership experience including supporting education, practice, and advocacy is priority. I hope to aid in the improving of benefits for members to serve their needs and retain their loyalty to the organization. Developing Leadership- We need new blood in FOTA leadership, on the board, on committees, and as volunteers. To protect the future of FOTA, and inspire its growth and diversity, a new leadership development program is being implemented to foster the involvement of OTAs, newly graduated OTs, and more seasoned professionals in FOTA leadership roles. Improving Communications- Members feel more involved and engaged when they are kept informed. This adds value to their membership. My goal is to expand the level of communications with FOTA members mainly through the use of technology, our website, newsletter, and social media tools. Be on the lookout for new strategies to communication and please offer your suggestions for improvement in this area. So there is my list of priorities moving forward with FOTA. I hope, above all else, to be a good listener and learner, in order to be a better leader. I welcome your comments and questions. Please contact me.